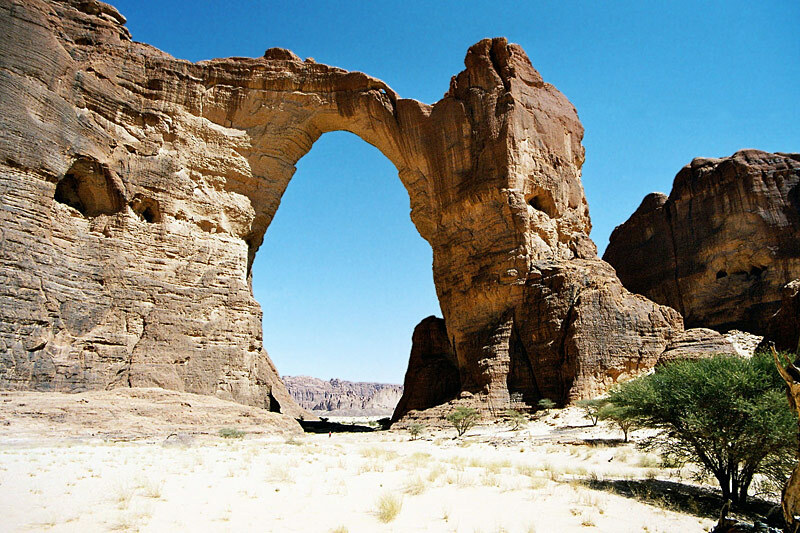 Aloba Arch in the Ennedi Range of Chad. Photo by Gunter Welz, NABS. Aloba Arch is truly one of the most magnificent natural arches in the world, but one of the most seldom seen. Notice the person standing at the bottom of the arch (just in front of the shadow) for scale!! 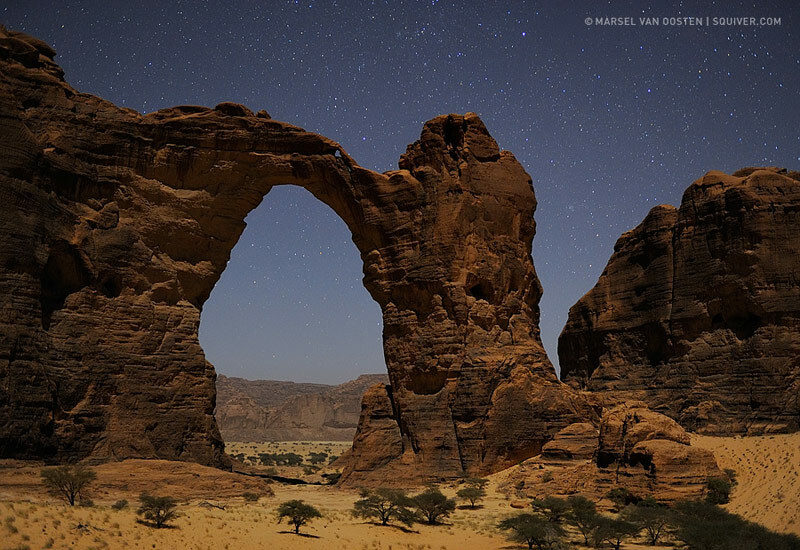 The arch is located in the Ennedi Range of the Sahara Desert in the northeastern section of the country of Chad, about 60 miles SE of the town of Fada, at a GPS reading of 34Q 632118E 1851327N (UTM WGS84). See our Chad Portfolio. See also four panoramic views of Aloba Arch. Aloba Arch has a span of approximately 250 feet and a height of nearly 400 feet. The first confirmation that this arch had a span of over 200 feet came from NABS member Gunter Welz, who measured the arch in 2004 using a Leica DISTO Laser Distancemeter. However, a direct measurement was not possible, so less accurate means were necessary. First, a direct measurement of the width of the opening at the base was made (48 meters or 157 feet). Using this number, measurement of photographs of the arch yielded an estimate of 77 meters (250 feet) at the widest point of the opening. The height also could not be measured directly because a reading could not be obtained. A reading was taken on a small overhang on the left side of the arch (looking from the west) at a height of 43 meters (141 feet). Measurement to this same point on photographs yielded a result for the total height of the arch at 120 meters (394 feet). This number was confirmed using a different technique. While at the arch, a compass with a built in inclinometer was used to identify a spot at which there was an angle of 45 degrees to the lower edge of the lintel. This forms a right triangle with one leg being the height of the opening and the other leg being the distance from this point to the bottom of the arch. This distance was directly measured at 120 meters (394 feet). This means that the height of the opening of the arch must also be 120 meters (394 feet). There is of course some error in this method due to lack of precision in the measurement of the angle. This extraordinary arch appears to have formed in two stages. The upper half was originally formed as a buttress-type natural arch at the end of a fin of sandstone. The lower half of the arch is in a softer sandstone layer that was subsequently eroded by a stream, creating a true meander-type natural bridge that is some 150 feet higher than Utah's Rainbow Bridge! This unique combination of formation modes in sequence accounts for the unusual height of the arch. For more information see Jay Wilbur's article on the Classification and Origin of Aloba Arch. The photo above, a 15-second exposure in natural moonlight taken by NABS member Marsel van Oosten, received a special commendation in a photo contest conducted by the Natural History Museum in London. Photo ©Marsel van Oosten (www.squiver.com).